Dissolving Identity in Adventure Time's "Beyond the Grotto"
On the latest Adventure Time episode, “Beyond the Grotto,” Finn and Jake pursue their pet sea lard into the pond, through a hidden grotto, and into a place that is at once familiar yet terrifyingly alien. It’s the eponymous time again!“Beyond the Grotto” is the much-awaited guest episode from Lindsay Small and Alex Butera, best known for their indispensible series Baman Piderman. Baman Piderman‘s undescribability is testament to its genius: it’s a series of shortish animations chronicling the whimsical / darkly surreal adventures of Baman and Piderman, two inseparable friends oh-so-tangentially based upon their Marvel / DC namesakes. As a series, it’s extremely important as an example of next-generation, internet-native animation. Small and Butera didn’t just that ingenuity in “Beyond the Grotto,” they arguably outdid it in the psychedelic factor. At the episode’s mind-bending core is an examination of dream-logic and identity as they pertain to cartooning, as expressed by a parallel dream-dimension that is to Ooo what Adventure Time is to our own lives. Yes, the episode does quite a bit of heavy lifting. The joy of Adventure Time is in seeing the flotsam of nostalgic and contemporary culture rearranged and redefined as cartoon, an art form that attempts to render its subjects in a streamlined, summarized, iconic manner–two dots and a line become a face, etc. “Beyond the Grotto” showcases the unexpected paradox at the center of this process, the idea that cartoons (and of course, dreams) function by reducing an idea down to its most central, basic elements, without the ‘extra’ details. Which isn’t too strange an idea yet: after all, we can write summaries of movies that are very faithful to the movie. The bizarre part is when you apply this to people, to identities. We’re accustomed to thinking of ourselves in terms of the very details that are stripped away by this ‘summarizing,’ ‘essential-izing’ process. We like to think of ourselves in terms of our favorite colors, food preferences, histories. But when we try to get the ‘main idea’ of ourselves the same way a stick figure summarizes the human body, the result can be completely, almost frighteningly alien. “Beyond the Grotto” expresses this point very vividly in its dream-within-a-dream plot, a throwback and homage to Wizard of Oz, Alice in Wonderland, The Yellow Submarine, and all others that explored the same ground. From the beginning, we’re subject to a whimsical but somewhat familiar dream situation: Finn wakes up with something alien in his bed, a sea lard that he and Jake had adopted at some undisclosed point. Now, every episode that features lards (a fictional animal species in Adventure Time that comes in flavors like ‘space lards’ and ‘grass lards’) is a winner to me, but “Beyond the Grotto” takes the lardiness further. Finn and Jake berate the sea lard for being gross, which is true (it’s got a big head-bump covered in sparse hair, and it oozes salt water) but rather callous nonetheless. Their rejection of the alien-looking sea lard later comes into play in a big way. They decide to toss the lard into the freshwater pond by the Treehouse, not knowing that sea lards are, of course, saltwater creatures. Once Shelby corrects them, they dive in to save it. The lard is sucked down through an underwater tunnel in the first of two very prominent tunnel sequences that establish the running dream-theme, of being transported to the unfamiliar. Through the water tunnel lies the Mermaid Grotto, sparkling with golden highlights and waterfalls. The resident mermaids point out the sea lard as it’s about to enter a whirlpool, the second portal they’ll be traversing. One of the mermaids has just enough time to warn them not to touch ‘the purple stuff’ as they dive in. The portal-within-a-portal device heightens the fixation on dreams, and dreams-within-dreams, which is appropriate, as the Whirlpool World beyond the grotto is as alien/familiar to Ooo as Ooo is to our world. As Adventure Time and all cartoons resemble reality, Whirpool World takes the familiar personalities of Ooo, retains their essential characteristics, but mixes up their material, outward forms. Finn and Jake are spat out of a pink pond before a Treehouse that looks an awful lot like the pond by the Treehouse they’d left behind. As they leave to track down the sea lard, a Finn-like rabbit wearing a backpack and a Jake-like dog crawl out of the tree to drink from the pond, which bears Princess Bubblegum’s smile, voice, and helpful charm. 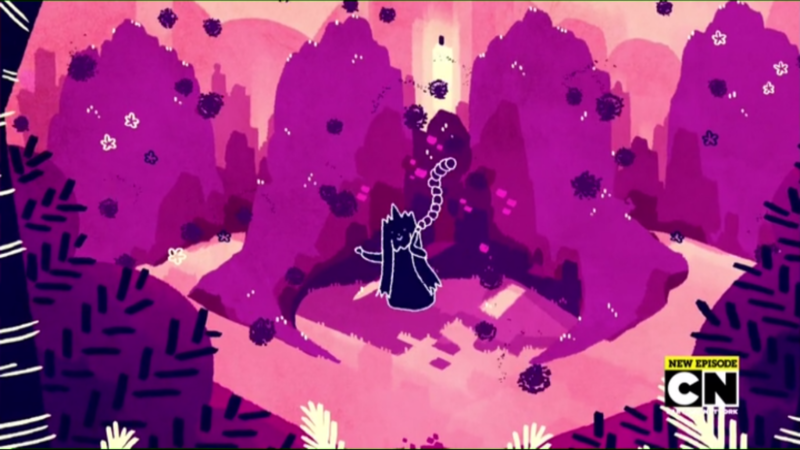 Along the way they meet a mad facsimile of Choose Goose singing in a tree, and get distracted by a leaf that croons and plays Marceline’s bass in Marceline’s voice. Most disturbingly, Finn and Jake encounter an amalgam of Ice King and Lumpy Space Princess that calls itself Princess Purplepatch, who speaks in a Yellow Submarine-esque layered singsong, with a sinister feel akin to that of the Blue Meanies. The purple clouds, foreshadowed by the grotto mermaid, emanate from Purplepatch’s maddening aura, and their influence causes Finn and Jake to forget their identities, while leaving their personalities intact. Purplepatch regrets “purpling” them and flies away in tears, mirroring the unintentionally self destructive tendencies of the characters that she references. When they arrived in the Whirlpool World, Finn described the sensation as uncomfortable, “naked” feeling; now, with all their identities stripped and forgotten, Finn and Jake have no defense against the freewheeling non-logic of the dimension. They forget the sea lard and their mission, and submerge fitfully into the mindless play of the dreamworld. Like the other personalities, they retain their playful and heroic natures, but their outward identity has been erased. We’re looking at Finn and Jake at their core, with all the arbitrary details skinned off, and the result is subtly off-putting. This erasure is the essence of what people call a ‘trip,’ and “Beyond the Grotto” gets it completely right. That they’re still essentially Finn and Jake is shown when the Treetrunks doppelganger, the apricot-loving BushBoots, shows up in tears. They promise to help her find her missing rolling pin, which is none other than the sea lard. BushBoots’ narrative has subsumed the original sea lard mission, as details are again mixed and distorted into another vaguely-familiar form. Once they capture the lard and bring it back to BushBoots’ to make apricot pie with, the sea lard escapes. Finn and Jake realize that it’s sentient, recognizing that it has intentions and an identity prior to BushBoots’ nonsensical declaration that it’s a rolling pin. After they rush out of the hut to rescue it, the sea lard manages to push Finn and Jake back through the pond, and into their home dimension. The episode closes as Finn lovingly tucks in the sea lard, and apologizes for treating it as a strange and disgusting sea creature, and the lard snuggles in to sleep. Throughout the episode, the lard’s intentions have been rather mysterious–it’s never explained why it looks to sleep in Finn’s bed (though maybe it just does, like cats do), why it runs away from them, and why it pushes them back through the pond. It probably resents being almost killed in seawater, and it probably rescued them from Whirlpool World because it’s terrifying, but we still don’t get a grasp of the sea lard’s intentions at the end. 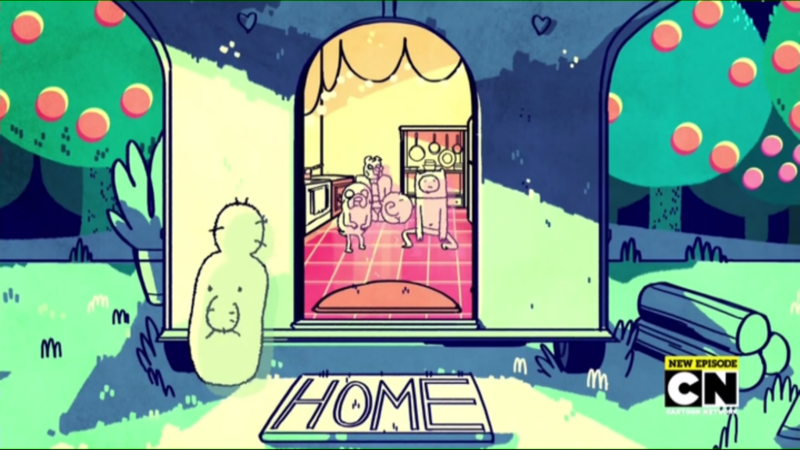 Hence, the basic plot of “Beyond the Grotto” is that Finn and Jake mistreat an alien-looking being because of its incomprehensible behavior, and in the process of pursuing it, come to realize that it’s a thinking being with its own business, and so come to love and appreciate it. And from that nucleus, the imagery and details of the episode highlight the idea that identity is a strange thing, and that the unknown and the Other should be treated with respect. But most of all, it examines a very simple yet strange phenomenon: that in summarizing a thing, trying to understand it and what it really ‘means’ to us, we’re often taken somewhere wholly unexpected. Especially when this thing is ourselves.